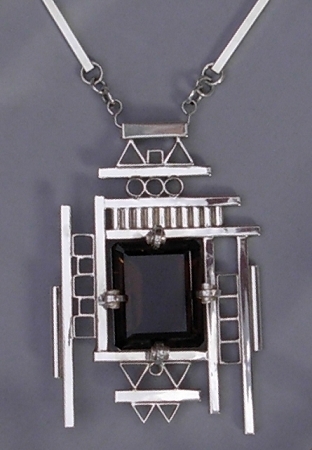 Cubist Jewelry - This is an artistic handcrafted sterling silver geometric statement pendant that frames a beautiful emerald cut brown smoky topaz, smoky quartz. This bold symmetrical necklace comes with a 24" handmade square tube chain. Handcrafted sterling silver pendant with emerald cut faceted smoky topaz. This exquisite pendant is suspended from a handmade adjustable sterling silver chain. This work of art is signed by Aaron.